Jay and Sandra Gelb ‘89 became parents on the morning of November 12, 1999. And again, four hours later. And again, five minutes after that. The triplets were born at 29 weeks gestation—11 weeks premature—and weighed a combined 6.3 pounds. “They were so small you could hold one in your hand,” Jay says. Doctors at Strong Memorial Hospital called the triplets Baby A, Baby B, and Baby C, and cautioned the parents not to give them real names for several weeks. They had less than a 50 percent chance of survival, and the bereavement for “named” infants would be longer and more painful, they cautioned. The triplets spent three months at Strong’s Neonatal Intensive Care Unit (NICU). Sandra took the day shift, and Jay stayed nights. This month, 19 years later, Matthew, Nicole, and Robert will enroll at the University of Rochester as part of the Class of 2022—literally across the street from where they were born. All three applied to and were admitted Early Decision to Rochester’s largest and most competitive Early Decision cohort yet. As members of the Class of 2022, they’ll be part of the most selective class ever to enter the College, from among a record 20,000-plus applicants. Matthew and Robert will enroll in the Barry Florescue Undergraduate Business Program, aspiring to follow their father into the banking business. Nicole plans to become a special education teacher. All three have been avid swimmers since age five and plan to join Rochester’s varsity team this fall. 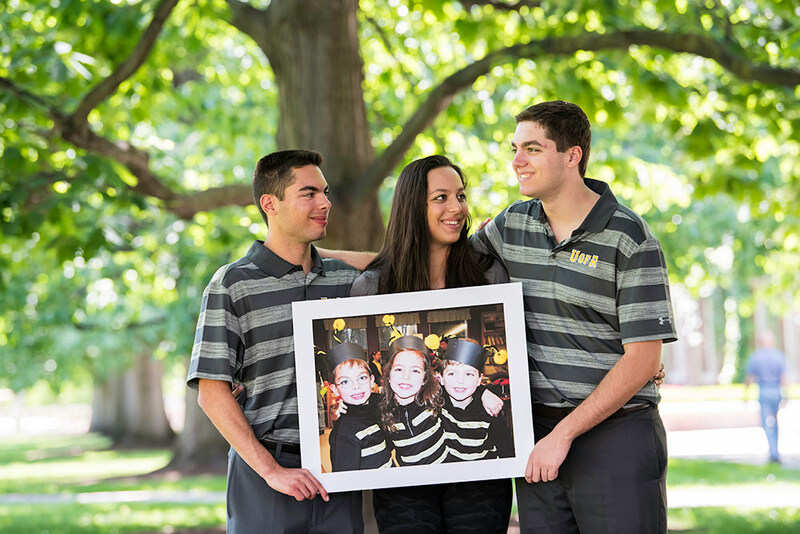 The triplets continue a deep family connection to the University. In addition to their mother, who earned a bachelor’s degree in psychology, their maternal great-grandmother, Anne Wolk ’58, who died in 2003, graduated from Rochester. And their grandfather, Allan Wolk, who died in 2012, was a professor at the Simon Business School for 41 years. Wolk taught his grandchildren the importance of community service, and Jay and Sandra reinforced it. Jay has been on the Golisano hospital board of directors for 18 years and is a member of the George Eastman Circle, the University’s leadership giving society. The family has purchased numerous Giraffe OmniBeds for Golisano through the years. The OmniBed pairs an incubator and radiant warmer to create a seamless healing microenvironment for babies. Last year, the triplets pooled their birthday and work money (and their parents matched them, dollar for dollar) to purchase another OmniBed. Nicole started a Golisano Children’s Club at her high school and organized a carnival to benefit the hospital, bringing 10 of her fellow students to Strong. The siblings also volunteer in a hospice home and work at the Jewish Home of Rochester, with duties ranging from manning the café to transporting residents from their rooms to activities to social visits. While Allan Wolk would be thrilled his only three grandchildren chose the school he loved, it was their choice to apply. They attended numerous summer sports camps at Rochester over the years and took courses last summer in the University’s pre-college programs. It was also their choice to stay together. One thing is certain: the brothers won’t share a dorm room this fall. The triplets attended the Harley School, an independent, college preparatory school just outside of Rochester, since kindergarten. All three are avid skiers who enjoy hanging with friends, and watching New York Yankees baseball games and NBC’s hit drama, This Is Us, a show about triplets. “Once I found that out, I knew we had to watch,” Nicole says. “She’s always looking out for our best interests,” Matthew says. In turn, the brothers are protective of their sister. “My two bodyguards,” Nicole calls them. Sandra started contractions soon after and spent the next eight weeks confined to a bed at Strong before the babies came. Matthew weighed 1 1/2 pounds, Nicole weighed 2 pounds, and Robert followed at 2 1/2 pounds. Sandra and Jay soon will be empty nesters, but their kids will be around the corner and plan to visit often. The triplets are ready for a new chapter.